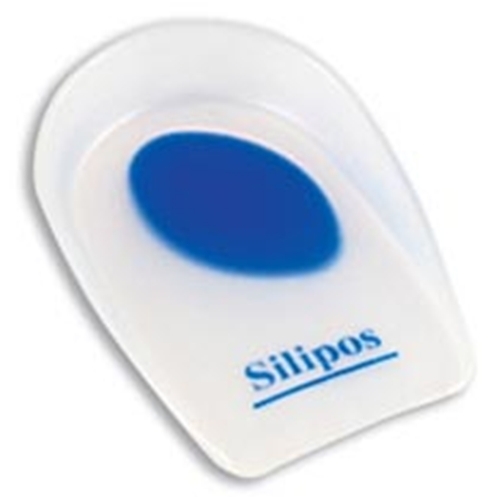 Silipos Wonder-Spur Soft Silicone Heel Cups from HealthyKin.com can be used in dress or athletic shoes for heel spurs, plantar fasciitis, knee and back pain and Haglund heel. Duo-density, medical-grade silicone ensures support and shock absorption. Softer silicone dots cushion sensitive areas. Lower profile thickness (4mm) offers patient comfort. Retains resiliency and will not dry out. Hypoallergenic., nontoxic, odorless and washable. Sold in pairs. 1-year warranty. Silicone is the secret! Studies have shown that high performance soft silicone cushions can relieve sore, aching heels, ankles-knees and back more effectively than custom orthotics costing hundreds of dollars. Made from a clear medical grade silicone for extra comfort, WonderZorb Cushions absorb the foot shock forces that can aggravate pain and discomfort with every step. Contouring to cradle the foot, these technologically advanced cushions feature a softer silicone dot to provide maximum pain relief where it's needed most.